General Policy Does not apply to cancelled or incorrect/ wrong product ordered. 6205 Engle Way - Suite H | Gilroy, CA | 95020 |. in good physical condition with minor scratches. power cable not included. DC -AC - Resistance - Current. Racal Dana 9902 Universal Counter Timer Working Condition. Does not include test leads, manual or box. Local pickup in. 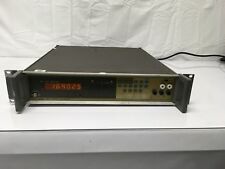 This unit is a good used Racal Dana 3 Ghz frequency. It has been tested on all 3 ranges. Full GPIB Interface. TESTED by our Lab Technician and works well! Sync Output. Item is used and in good condition. Was tested to power on and no further testing took place. See pictures for more details. Model: 6002. When you buy an item it will not be listed as a "gift". It will be valued at exactly the price you paid. All units are sold without manufacture warranty information. we record serial numbers/parts to avoid Fraud. You will receive a quicker response simply by sending us. Racal-Dana Digital Multimeter 4002. S/N 34201. Powers on but otherwise untested. Make offer. Very clean, and working frequency counter 0-100 MHz. This item powers up fine, but says ERR 34 on the screen when turned on. The serial # on this item is: 123694. THERE ARE NO EXCEPTIONS! For orders within the. Model 6001. Part # Model 6001. Includes Power Cord. Rack Ears On Unit. There Is A Pull-Out Instruction & Code Manual On Bottom Of Unit. Plugged This Item In And Unit Powered Up, It Then Gives One Of 2 Codes, Err 36 Or Err 20. Power cord not included in sale. Item was tested to power. See the pictures for more details. S/H in continental USA. Other Notes of Interest. Condition: As pictured. I’ll try to help you. AM modulation depth ranges: 5, 10, 15, 30, 50 and 100% FSD modulation depth. Modulation frequency range: 50 Hz to 10 KHz. FM deviation ranges: 1.5, 3, 5, 10, 15, 30, 50 and 100 KHz peak deviation FSD. The user can optionally add as many or as few features as they desire. with option # 66. Series 6000. BHSX (NON-CORE DATA) CIRCUIT CONSTRUCTION TYPE ELECTRONIC, SOLID STATE. FEAT SPECIAL FEATURES DIGITAL READOUT; COMPUTER INTERFACE GPIB; 6-1/2 DIG READOUT; AC TO AC V RATIO. Model: 1991. Used in great overall condition. Shows normal signs of use. Nothing more, nothing less.